Last year we received a grant from the Winston Churchill Memorial Trust - an amazing organization that offers individuals an opportunity to travel abroad to learn and share with others working in their field. In our case, we were inspired by some of the first and finest community supported fishery initiatives happening in North America. So our travels took across the pond to start a trip that would take us up the west coast of the US from Los Angeles to Vancouver, Canada. This August we completed our trip with a final mission to the east coast to meet with New York's first community supported fishery, founded by Sean Barrett. Meet Dock to Dish. Based at the eastern tip of Long Island in Montauk, NY, Sean’s venture started out much like SoleShare, with a box scheme approach, connecting the region's small-scale fishermen directly with their community of members across Long Island. Today, Dock to Dish has grown into something with more far reaching impacts. 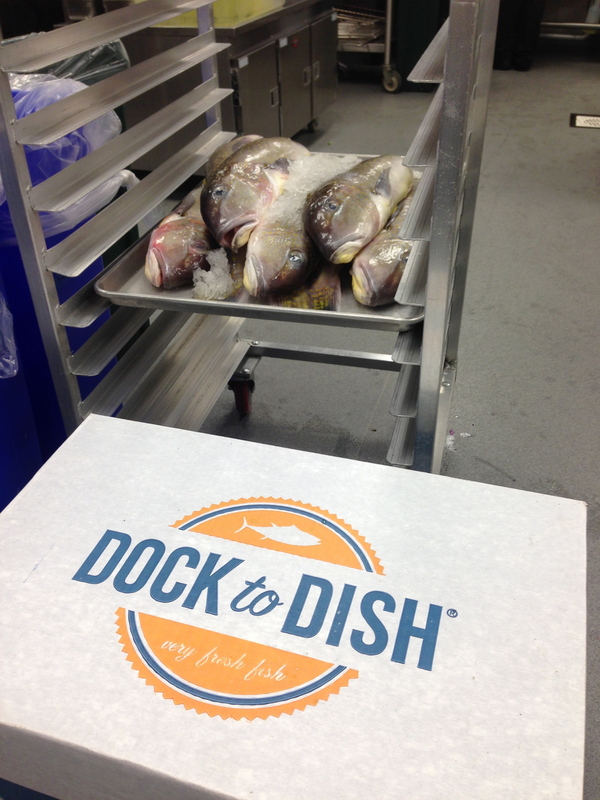 In addition to providing fish for the community box scheme, Dock to Dish now supplies Manhattan’s finest restaurants - from Michael Anthony's The Gramercy Tavern to Chef Dan Barber's Blue Hill NYC & Stone Barns. With the help of these forward thinking chefs and their enthusiasm to take the plunge, Dock to Dish has set up the countries first Restaurant Supported Fishery, and New Yorkers are eating it up. I joined Sean on his weekly route from Montauk's docks to Manhattan to get an inside look at their story, from dock to dish. We started off from Montauk at 3am with a boot full of the days catch - golden tilefish, a local fish with some serious sustainability credentials. When it comes to sustainability, Dock to Dish mean what they say. On evaluating the "sustainability" of specific species, Sean accounts not only for the species' stock status, but also considers habitat conservation, gear types and harvest methods. With the term 'sustainable' banded around a lot in the fish world, it was refreshing to see robust checks happening to ensure their fish really is the reel deal. After delivering the day's catch to their restaurant members across Manhattan, we landed at Untitled, recent Dock to Dish member and brand new restaurant at the Whitney Museum of American Art. With chef Michael Anthony at the helm, I had a chance to see some behind the scenes action with the golden tilefish taking centre stage. The day's catch were carefully unpacked & masterfully prepared by the restaurants own butcher. Today's special: Golden tilefish with corn, sweet peppers & curried squash. The kitchen staff could all tell you where the tilefish came from, the name of the fisherman who caught it and when it hit the dock. And it didn't stop there. Every single front of house staff member knew the tilefish's story too. And for every customer that walked through the door hungry for a fish dish, they'd soon come to know the where, who and how their fish landed on their plate. With every fish dish that came out of that kitchen, a story came with it too. Hearing that story weave it's way from the sea to the city was a brilliant thing and showed that Sean's tireless efforts to maintain a genuine connection between the fishermen, the fish and the plate are getting through, loud and clear. Here's to hearing more dock to dish stories this year, here and abroad! Massive thanks to Sean Barrett, Paul Farnham, Mike Anthony, Jenny Jones, Susanna Cupps, Trevor & Danny for making it a memorable trip!